When is a bun not a bun? Who knows, it all gets rather confusing. Some might call these American muffins, some cupcakes or maybe even fairy cakes. For me a bun is generally something sweet and yeasty, a cupcake is a sweet cake with some sort of icing, a muffin is a less sweet cake without the icing (unless it’s an English muffin and then it’s a type of yeasted bread roll) and a fairy cake is a more refined and probably smaller version of a cupcake; it seems these are often used interchangeably. Going by my definition, these buns are somewhere between a muffin and a cupcake: they have no icing, but are sweeter and smoother in texture than a muffin. Now we’ve got that one cleared up, I want to say a big thank you to C of Cake, Crumbs and Cooking – do check out her baking blog if you haven’t already done so. Quite some time ago she had a giveaway for the Great British Bake Off: how to bake the perfect Victoria sponge. I was the lucky recipient of the book and it was waiting for me when I got back from holiday – nearly a month ago now. Along with many of you, I’ve been following the Great British Bake Off (via iPlayer) with great interest and enjoyment, so I was doubly pleased to get this book. As it happens the book only features one recipe from each of the contestants, but it does contain the technical challenges as well as a handful of really good step by step “how to make” items such as the perfect Victoria Sandwich. Most of the recipes come from Linda Collister, who wrote one of my favourite chocolate books Divine, but as far as I can see, have nothing to do with the programme. This book formed my bedtime reading in September and there are lots of recipes I want to try. However, with time being at a bit of a premium but wanting to make a start, I plumped for these quick and easy double chocolate buns. These “buns” were smooth, not too sweet and all together quite delicious. They were moist, light and had a nice crunch of white chocolate. CT managed to sample a few (he always does) and thought they had a melt in the mouth texture and a treacley flavour but without the cloying quality that those sorts of cakes sometimes have. The book stated these were best eaten the same day, but they were just as good three days later. How do you define buns, muffins etc? A light but moist cake with a smooth texture and crunchy bits of white chocolate that are quick to make and quite delicious. 250ml mixture of crème fraîche and low fat Greek yogurt. Sift in dry ingredients and mix in alternately with crème fraîche and yogurt. Stir in 100g chopped white chocolate. Place onto a rack to cool, then dust with icing sugar if desired. Can use all crème fraîche or all yogurt instead of a mixture of both. I think of a bun as a sweet yeasted bread, a muffin is made by taking a dry ingredient mixture and adding a wet ingredient mixture to it, a cup cake is made from a creamed butter and sugar mixture with flour folded in. I have no position on fairy cakes! But your bun/muffin/cupcakes look absolutely sublime! Foodycat – perfect, a good way of describing the differences. Well, I’m with you regarding what constitutes a bun, cupcake, fairy cake, etc. 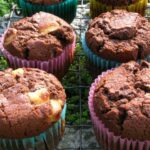 I often make muffins when I need to make something quickly before the girls come home from school – these buns could be on the menu for tomorrow! I think I agree with you on the definitions, Choclette. These little cakes look good, whatever they are! You know I have strong feelings about this topic! LOL! Muffins to me are ONLY the yeast raised ones that are split open and slathered in butter, the ones Americans call English muffins! These look like BUNS to me and I love them! Buns that are yeast risen are called BREAD buns or by their name such as iced buns, Cornish splits, currant buns Sally Lunns etc!! What ever the name may be, these look divine! It doesn’t matter what they are called, they look yummy! yeah, bun for me is always more bready but then those darn Americans have ‘biscuits’ which are essentially scones… who knows… the only truth is if they tasted good, which quite clearly they did!! Jennifer – Glad I’m not too far off then 😉 Do let me know what you think of them if you do make them. Suelle – thank you, it’s good to get confirmation and whatever these are, they are very good. Catherine – thank you. That’s what I thought buns were too. Oxslip – thank you. I did wonder if this might be a north south divide think. Dom – it’s all very confusing, but ultimately you’re right, what’s in a name. To me a bun is a northern (being a northerner transplanted to the south) fairy cake. A fairy cake is the same as a bun and a cup cake is an American fairy cake! But what’s in a name – these buns look so lovely and choclately! Ooooh! I just bought the book today, but ended up teaching so haven’t had time to try anything yet! One I know which recipe to bake first! I think a bun is a plain little cake, a fairy cake is the same but with icing, glacé or butter and some sprinkles (100s and 1000s no less) on it. A cup cake is larger, brasher and often over decorated! I think of a bun as something heartier – yeasted dough not baked in a case, while muffins are slightly more moist and dense and cupcakes/fairy cakes are a little lighter. But who cares really? When something looks as yummy as this you can call it what you like! I am impressed they lasted 3 days. I’m with you on the definitions. Would you recommend the book then? I’ve had it on my amazon wishlist for ages. they look lovely. Interesting discussion, it does seem to vary from region to region what things are called. Still these look yummy and very chocolatey rich! I like the word “bun” for little cakes as it sounds so British to me, and if they have a different texture to a muffin then it’s fine by me! These chocolatey buns are gorgeous! You had me at double chocolate lol. They look fab. MCB – thanks, I think regional is the key to this. Actually I’m pretty sure they are called buns here in Cornwall too. A Trifle Rushed – ha ha, you have strong opinions about cupcake decorations, I like it. Hope you are enjoying the book. LittleLoaf – thank you. It is quite useful to know that we are all talking about the same thing, but ultimately you are right of course. Baking Addict – hard to say about the book as it depends what you are looking for. I was enjoying it, but I’ve now bought Dan Lepard’s Short & Sweet which I think is brilliant. Johanna – I think this discussion has revealed that the naming of buns is indeed a regional thing. I’ve learnt something anyway. Chele – as a white chocolate fan, you’d love these. Thank you so much for the lovely link! I’m really glad to hear that you’re enjoying the book so much – so am I! These look like a great way to dip your toe into the book too! I would say a muffin is something made by mixing wet and dry ingredients, a cupcake is a creamed mixture, generally larger than a fairy cake, which I consider to be made in a bun tin, rather than a muffin tin, in terms of size and decorated with buttercream or coloured icing. A butterfly cake is a fairy cake with buttercream and wings, and a bun is a fairy cake with a plain water icing, perhaps decorated with smarties or a piece of Cadbury’s flake, or a cherry. A bread bun is what it says, and not a sweet item – usually used for sandwiches. Apparently all of these terms mean something very specific for me!!! My copy of the British Bake Off book arrived this morning. I have had a quick flick through and was a little disappointed there weren’t more recipes from the show but I am going to have a cup of tea and read it now. I feel I ought to have one of your lovely buns with me while I do it. loved your definitions and yes, I’ve always been confused between fairy cakes and cupcakes, although I’d say that cupcakes have far more dressings on top – so much that at times, it’s about as much as the cake underneath! The rest are the bald versions. Mozart’s Girl – thank you for your very kind comment. Have really been enjoying hearing what people have to say about this subject and there are some very strong views. Lady Chutney – yes, it would have been nice if they’d featured all of the recipes. Have you made anything from it yet? At the end of the day, if it’s delicious, why debate? 🙂 If it’s good, eat it! And, these look GOOD! I am a muffin, cupcake, or bun gal! I love them all. I have this fave place in NY for cupcakes though. I love it. I must try these though. These look delicious. I will try to make these at the weekend. I just made your buns and they turned out extremely light and very, very good. The only thing about them is that they lacked a bit of sugar. I know you described them in your post as not overly sweet, and that was one of their attractions to me, as I don’t like things with too much sugar. But even to my taste it really missed a little bit of sweetness. As I can’t find mollasses sugar around here I used the same amount of muscovado instead. Do you think that it can be a good replacement product, or would you suggest something else? Thanks for trying them out and sorry you didn’t find them quite sweet enough for you. You can always increase the sugar if you prefer it sweeter and soft brown sugar either light or dark is fine. I made the comment just above, and since then I made your buns several times, only adding a little bit more of sugar. And they really are the chocolate cakes that I enjoyed the most in a very, very long time. So I just wanted to thank you again for sharing this recipe with us, and for all the recipes you bring to us in your blog. Thank you for your kind words Marie, they are very much appreciated. I’m glad adding a bit more sugar made the difference for you. I think it’s time I made these buns again to remind myself what they were like.